I have been enjoying cauliflower rice for more than a year now and it is such a great sub for rice. Adding carrots and spices is so good.. Excellent cauliflower rice, yet to try at home. Interesting way to enjoy cauliflower. Will give a try soon. Simply wow...Your pics are making me drool. This is my long pending list, but never tried, definitely trying it now. I have not yet mustered the courage to try cauliflower as a rice. Yours is very tempting and sounds super duper easy. Looks colourful Harini. I have not tried cauliflower rice as yet. Sounds yummy and easy. Harini cauliflower rice is one dish I've made and love it. Yours looks so like rice. Light and healthy. Reading about all the cauliflower Rice makes me want to make it, I once tried something similar for the pizza crust and it failed. Will have to try again. That bowl looks amazing harini. I have a read a lot of this but have not tried it yet. Your version looks very colorful. Such a delicious and healthy bowl Harini! That’s a nice tip to add salt at the end. Love your pics!! kept scrolling up and down to see if theres more to the recipe took me awhile to realize its a super easy one......we need more like these..........hahaha......love it! 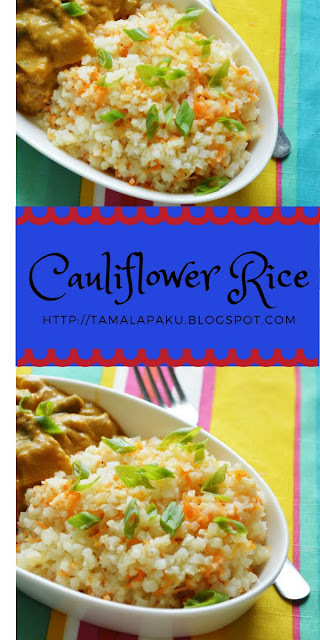 I have heard a lot about this rice and wanted to make too but somehow I always use the cauliflower for paratha or sabzi. Your combo with the curry sounds superb. I didn't know about cauliflower rice. Thats something really new for me! Never heard about this type of dish or grain... looks so healthy sub of rice.